Philips Lifeline invented the medical alert system category over 40 years ago and is the number one service in the country today. 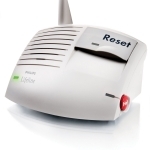 JFSA offers two types of Lifeline: Home Safe and GoSafe for both landline and wireless homes. Additional features include fall detection (AutoAlert), GPS—enabling users to travel anywhere in the continental US with their Lifeline, and professionally trained 24/7 multi-lingual staff who quickly assess and send help when there is an emergency. Best of all, there is no minimum contract obligation with a monthly Lifeline subscription and no fee if you decide to cancel. When you arrange your Lifeline subscription through JFSA, you get an even better value compared to other manufacturers. While other manufacturers require their customers to install their units by themselves or for an additional cost, JFSA sends trained staff to install the Lifeline unit at no additional charge. This ensures that the Lifeline unit is installed correctly. The JFSA staff maintains regular contact with Lifeline customers to make sure they are satisfied with their unit and answer questions they may have. Summon Help Press your AutoAlert Help Button at any time to activate your in-home Communicator and connect to Lifeline’s 24/7 Response Center. Your AutoAlert Help Button can automatically place a call to the Response Center for help if it detects a fall and you cannot press the Help Button yourself. Hear a Reassuring Voice A trained Lifeline Response Associate will quickly answer your call, access your profile, and assess the situation. Get Assistance Know help is on the way. After assessing the situation, the Associate will contact a neighbor, family member, or emergency services based on your specific situation, and follow up to confirm help has arrived. 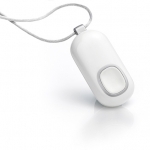 AutoAlert fall detection Your AutoAlert pendant is designed to sense when you fall and contact Lifeline automatically if you don’t, or can’t, push the button. 6 location technologies GoSafe uses GPS, WiFi, cellular networks and more to help us quickly identify your location. Access to our Response Centers 24/7 Our multi-lingual Lifeline Personal Response Associates are professionally trained, standing by to answer your call and assess the level of emergency. Two-way voice communication Speak directly with a Lifeline Response Associate through your Communicator at home, or directly through your pendant if you’re outside the home. Ability to call multiple contacts The Response Center will contact a child, caregiver or neighbor if emergency services aren’t necessary.